Co-working space started only as a shared working environment where entrepreneurs can work from because early bird entrepreneurs were usually struggling to find a place where they can find many facilities (Office, Internet service, printer, scanner, photocopy machine, computers ), but later on, when the entrepreneurship concept spread in 2008 after Mr. president Barak Obama was elected for the first time as president of the United States, he started spreading the concept of entrepreneurship. USAID (what is USAID? )offices all over the Africa continent have deducted part of its budget towards entrepreneurship, spreading the concept in the green continent. The MENA region was lucky enough to have more funding opportunities not only from USAID but also from other international donors from all over the world (i.e. Danish International Development Agency DANIDA, Swedish International Development Cooperation Agency SIDA, UK Government Department for International Development DFID, and many more). The activities of Co-working spaces have changed, the type of activities and programs that most of the co-working spaces in Egypt have started implementing, reflects the idea of overlapping the new two concepts “Co-working & Entrepreneurship” in one unit, where we can find co-working space not only hosting SME or Startups but as well offering series of developmental & entrepreneurial programs that help both the entrepreneurs and their startups & SME. These funding opportunities have reflected on the co-working spaces in the region, as there are many entrepreneurs who were hosted by any of the co-working spaces, who use its services and joined its programs. Many Entrepreneurs with solid ideas were funded by one of these international donors and managed to start their own company. That is why co-working spaces play an important role , it’s not only offering offices -you can get that somewhere else- but they are helping building entrepreneurial & sustainable communities by inspiring entrepreneurs with ideas, networks and different developmental & entrepreneurial programs that unleash the entrepreneur’s skills and bring stability to his/her project, at least for the first 3 years until the project could stand alone and has its own legal umbrella. In other words, co-working spaces are the main source of sustainability for startups or SMEs which is why I have interviewed one of the most influential entrepreneur started a co-working space back in the old days, when the idea was new and no one in Egypt was thinking of implementing such a project. His name is Mazen Helmy – District founder. Mazen is a Civil Engineer, graduated in 2008 from Cairo University, brought up in family where his mother is a doctor and his father is an engineer. Mazen was a professional swimmer, he used to swim since he was kid until 23 years old, he joined many local competitions and he won some.Quoted by Mazen “Swimming taught me how to be independent”, he started to be more involved in the community by joining developmental and charity activities within his community. With a group of friends he established a foundation called Youth4Life in 2006 that focuses on implementing leadership programs & activities for youth, and creating awareness campaigns about HIv / AIDS prevention. Mazen used to work as a construction engineer, even when he was a student, at his father's construction company before joining the Egyptian Army for a year after he graduated. Mazen: “I learned a life and technical skills during this period, and I discovered that people can exceed their limits if they want”, unfortunate for political reasons the Youth4life foundation has been closed in 2008, Mazen has taken a strategic decision that he will not continue to work as engineer, quoted by Mazen “Construction in Egypt is very old fashion, and there is no innovation, it’s all about limiting the cost”. Mazen is always looking forward to travelling and learning, he has been in Germany and Holland in 2010, he was so inspired by how mainly the Netherlands is using its limited space and resources. Quote by Mazen “Although they have limited land space, they use it very well. In our MENA region culture usually we are not using available space effectively, even if someone has his /her own land, he/she is not using it to do garden or plantation, or anything else that can create value, safe environment and generate revenue “, Mazen added to his point “Even the construction there, they are looking very attractive and creative”. When Mazen came back to Egypt, he had the idea of starting a restaurant with a supply chain based on the food produced bylocal women. The restaurant was open for 4 months when the Egyptian revolution in 2011 started, and unfortunately he had to close his restaurant. After his trips abroad and seeing many different business models, Mazen had the idea of creating a space where people can share knowledge and be inspired. He was not convinced himself with the idea yet and he didn’t even know how it would work, but he had the chance again to travel to Berlin, Germany during Sept. 2011, where he was attending a co-working space conference, and he was as well on the conference panel talking on behalf of MENA region and particularly Egypt about the revolution. 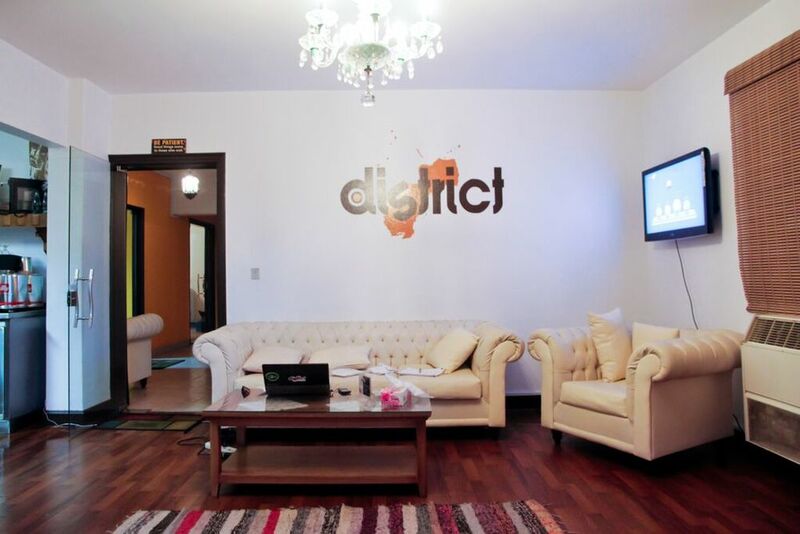 Mazen came back to Egypt very inspired, and he has started his own co-working space called District. Quoted by Mazen “In Egypt, it’s easy to start a business, but it’s very challenging keep it, and keep it growing, vise versa in Europe it is hard to start a business but it is more easy to keep it going.” It was a very challenging period for Mazen and his partners, because customers were not educated with the co-working spaces concept and they didn’t even know what is about or what it could be used for. Quoted by Mazen “During my experiences visiting some countries in Europe, I realized that they build their community first, then they start their spaces. It is the other way around in Egypt, where we have to build the space first and then introduce it to the customers”. Mazen and his partners kept trying to spread the co-working space idea for the first couple of years after launching District in 2011, the first client was a German entrepreneur who came with his wife who was working as a teacher at German University in Cairo (GUC), then the second client was Sherif Hosny and his brother Tarek who started Schaduf Agriculture company and they are still coming to District. Their project success story was published at Wamda; Schaduf Sows Sustainable Development with Rooftop Farming in Egypt.The third client was Tech Fast Creative Marketing Solution Company.Quoted by Mazen “We had a diversity of entrepreneurs who either already had their company or they just had an idea. We have consultants and individuals who are working in different fields (Constructions, Marketing, Printing, Training, etc)” added to his point “We didn’t use any marketing tools or channels to announce about our services but the word of mouth was enough for us to bring potential successful entrepreneurs to our community”, Mazen has a different definition for the co-working space, it’s not only a place where people are coming to work, it’s a life style, and it’s all about inspirational and productivity! Quoted by Mazen “We have a limitation in our space at District, we have only a certain number of square meters that we have to use efficiently and we did”. Mazen and his partners are the pioneers and innovators who Promoted the co-working space concept in Egypt. They thought of implementing different programs while offering the same basic services that any co-working space can offer for entrepreneur, they started implementing educational programs, match making platforms, and investment opportunities, they chose late stage entrepreneurs or mature entrepreneurs whose ages between 25 – 40 years and they want to grow, one of the biggest project that District has organized called XpandSummits in Jan. 2015, Xpand considered one of the first and biggest Financial summit in the MEAN region that Hands-on financial solutions for scaling up SMEs in local & regional markets, it’s annual summit and the main partners in the 1st summit were MC Egypt , Bedaya , Egyptian Banking Institute , Private Egyptian Equity Association , Endeavor Egypt , Cairo Angles , Egyptian Junior Business Association , NILEX, the summit has gathered the financial sector at the companies and potential entrepreneurs who have SMEs. May 2013 District has started organizing one of the best educational program called Knowledge space , Knowledge space creates an opportunity for knowledge transfer and skill sharing. The program focuses on capacity building and match making and it consists of two activities, a series of workshops in different fields that matter to the entrepreneur s (i.e. Marketing) delivered by experts in the field, and a dinner with a limited number of invitations to investors and entrepreneurs. For both activities, Mazen usually recommend entrepreneurs who he knows personally or shares the opportunity in public and screening requests.,Rhe program is still running, and is repeated every 3 months. The last program that District started implementing is called Soft Landing. They have not announced it yet, but the main idea behind the program is helping Egyptian companies to open a new market for their products or services abroad., The initial plan in the coming two years is opening markets in MENA regions countries, and by 2020 District will help the Egyptian companies to open market in Sub Saharan Africa. Mazen has managed to reach to the breakeven point late 2013, and he agreed with his partners that all the revenue that they are generating will be reinvested in District to create more educational programs. Sustainability from Mazen's point of view is not about money, but is about how the business could move forward without Mazens presence. Quoted from Mazen “there was a time when I was tired, and work wasn’t done properly. I realized that District might fall if I decided to step down and that means that there is something that needs to be changed. District shouldn’t mean only Mazen, if I want the company to age well, I need to create value that is run by a system and I need to invest in the process so later on, whether or not I am present, things will go well and for the long term plan I am sure that sustainability is existing”. Mazen prefers to invest in people. You could ask any employee at District, starting from the office boy to the project coordinators, they know what the district is doing And what’s the district visions. So whenever Mazen is not present, things will move smoothly and successfully. Ongoing District is organizing concerts, expeditions and on a yearly basis they are celebrating their anniversary, they love to invite their followers to have Iftar during the holy month Ramadan. One of the biggest international awards Mazen received was being selected by Forbes Magazine as one of the 30 Most Promising Young Entrepreneurs In Africa 2014. Quoted by Mazen “We have 4 core values; stay positive, cross boundaries, innovate & collaborate, and done is better than perfect”, and as Mazen has mentioned that blue ocean comes when we mix markets, so District will continue discovering new markets and innovate new ideas. District plans in the coming few years to expand in Africa, there is nothing solid or guarantee which countries they are going to expand in, but they would like to expand by building different hubs which will help to connect the communities, build trust, share ideas and markets as District will always support ideas that cross boundaries, innovations, operations and markets.